For any business looking for a simple approach to operations but in need of high performance the Dell PowerEdge T410 Tower Server is the perfect solution! With scalability up to 128GB of RAM (8 DIMM slots), 12 processing cores with Intel Xeon 5500 and 5600 series CPUs, Quad port NICs, and 5 PCIe expansion slots, the Dell PowerEdge T410 makes a versatile server option for those IT Pros that need the performance without the rack. Also with six drive bays supporting either 2.5” or 3.5” HDDs and up to 48TB of total storage, the Dell PowerEdge T410 is an excellent fit for any entry level file server, SQL database, or virtulization maximizing the overall value of the unit for any SMB through versatility and scalable design. 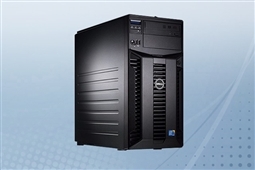 Aventis Systems carries Aventis Certified Reconditioned Dell PowerEdge T410 Tower Servers. All servers from Aventis System include a 3 year Comprehensive Warranty, with eligibility for optional Express, Extended, and Secure Drive Warranties as well as Onsite Services.